This week my girlfriend and I had to settle a disagreement by comparing Wikipedia's climate information about Xiamen and Chengdu. I thought Xiamen was probably hotter; she thought Chengdu. (I was right!) I also have an air-conditioner in my apartment, which many of my colleagues might envy, yet I refuse to turn it on. If I moved to Chengdu or Xiamen would my moralistic imposition of a "no AC" rule come to a halt, though? It is regularly 90-degrees Fahrenheit there and the humidity in both places leaves you wringing wet. 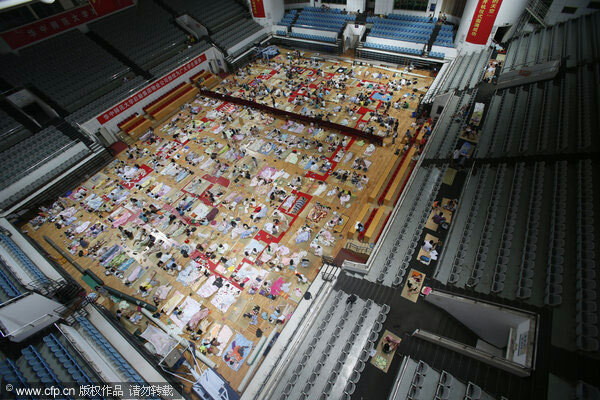 Today, a picture essay in China Daily shows 600 students in Wuhan sleeping on a gym floor to avoid the heat of their four-, six, and eight-person dormitory rooms. Nearly 600 students sleep on the floor of an air-conditioned gymnasium to avoid the heat in their dormitories at Central China Normal University in Wuhan city, Hubei province, on June 21, 2013. The university opened its gym to students as the heat wave lingered in the city. Besides the gym, all the university's air-conditioned venues, meeting rooms and halls are open to students, who are also provided with mats. The recent scorching weather in South China has triggered widespread complaints about the living conditions of university students, whose dormitories are not equipped with air conditioners. Some of them called for the university to install air conditioner in the dorms. Though I am loathe to take any advocacy position in China without first registering with the government, I want to come down solidly on the "Say No to AC" side of this argument. If you think that I am inhumane, please read Stan Cox's Losing Our Cool. (N.B. I have not read it, but have read the reviews and most of his articles on everything from "Handcuffing the Property Cops" to rationing.) We need to have this conversation and we cannot get it wrong. China and India--with millions more people living in Florida- and Arizona-like temperatures than the US--cannot get it wrong or we are doomed. Hang Kei Ho, a graduate student in UCL Geography was a runner-up in the annual UCL Graduate School Research Images competition. His photograph, Air-conditioning in Hong Kong, showed patterns of air conditioning units in a Hong Kong high rise building. Cox lays out the case succinctly in a WaPo piece from 2010 (now three years ago!). Did Obama and Xi Jinping discuss air-conditioning? I doubt it, but they ought to have made it a top priority. I am watching a building boom that seems oblivious to realities of this world. China cannot cave to its college kids on this point or humanity will pay the price. Much of the research on thermal environments and student achievement is quite old. "Manning and Olsen (1964), in their study, concluded that air condition was considered to be the most critical factor in providing an optimum thermal environment for learning." While experts--perhaps funded by GE--have agreed since the 1960s that a cool environment breeds academic success, the discussion gets derailed when it becomes a battle between the "eco-nags" and the "comfort queens." In fact, we should be talking about re-design of our building stock and careful planning for future development that incorporates natural cooling...along with space for line-drying! We can re-examine our school year schedules and the length of the school day. There is much that can be done before we install the single biggest driver of peak electric power consumption. Necessitating more coal and nuclear plants spells certain disaster. In 1988 when Chicago had forty days of 90+ degree days I couldn't get/stay cool enough to get much done. I tried every thing I could think of: drank and drank ice cold water until I was visiting the toilet like clock work. Soaked in cold water, sat in front of a fan, kept my head wet, wore loose light clothes. I was so busy trying to stay cool enough I hardly got anything done. My husband bought a one room window air conditioner and we slept in that room. The next day I had the whole house cleaned and dinner made. Just having a place to escape the heat and not having to sleep in the heat made all the difference. I don't like A/C and try and avoid it, but I've found that some days are just too hot to not have a cool place to escape to.